I am following a little behind as I had to get re-certified for ground search and rescue this weekend, so my Halloween plans were put on hold. We did manage to carve all of our 14 pumpkins, though - and they looked absolutely AWESOME all lit up! 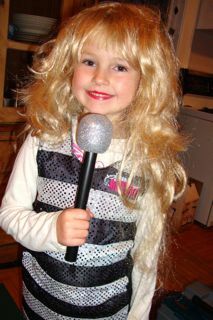 The Peanut went out tonight as Hannah Montana - my goodness she looked so funny with so much hair, LOL!!! We ended up meeting up with some of her friends from school so she had a blast - not that we wouldn't have on our own. She was feeling a little under the weather and was happy with only a couple hours of Trick or Treating :) We lucked out with the weather, here, and the rain held off. Another season down....so many plans for next year, and I will post my finished October Daily Album hopefully tomorrow. Aw... she looks super cute in the photo! Thanks Pris :) We had a really good Halloween!